Derek Mackay, Minister for Transport and Islands, Scottish Parliament. Les Huckfield, Glasgow Caledonia University. 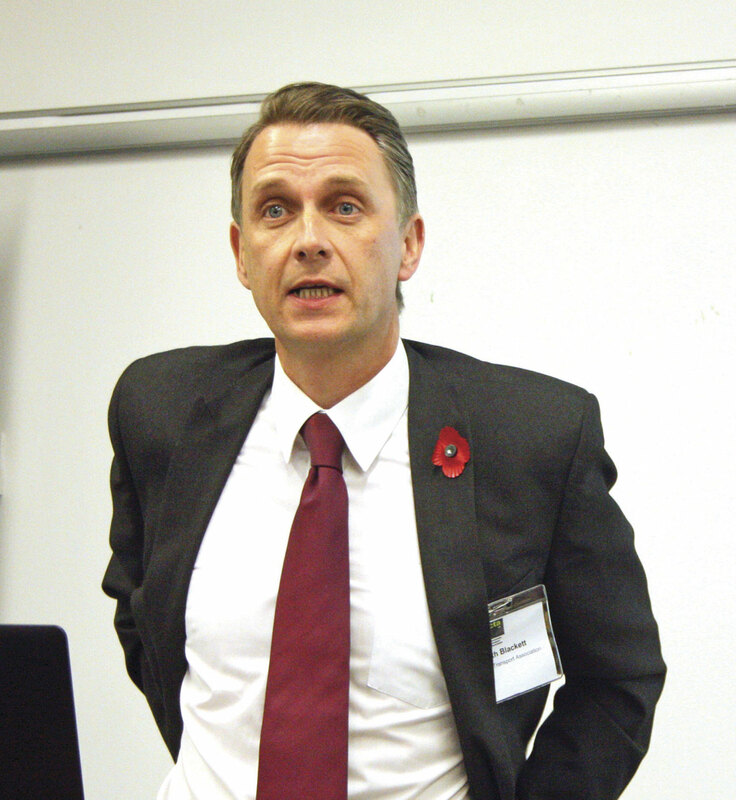 Gareth Blackett, Director of Policy and Practice, CTA-UK. Calum Irving, CEO Voluntary Action Scotland. The Scottish Government has in recent years demonstrated a robust commitment to community transport in Scotland, believing that CT is essential to prevent social exclusion in areas where the lack of population and rural nature mean that conventional bus services cannot be viable. As a result their funding to local authorities for use on community and social transport is generally seen as more generous than other parts of the UK, particularly England. During his keynote speech at the CTA Scotland annual conference in Edinburgh the Minister for Transport and the Islands, Derek Mackay MSP, confirmed this commitment will continue if, as expected, the SNP retains its control of the Scottish Parliament following the elections in May 2016. He began his address by talking about the Westminster Government’s Buses Bill saying that there was no prospect of Bus Regulation being brought back into Scotland. McKay had had a busy couple of days because the day before he had given the keynote speech at the CPT Scotland conference where he had taken a similar line. He said that the Scottish Government preference was partnership with all stakeholders in the sector, including community transport, working together to achieve the best and most cost effective public transport for all its citizens. His guiding principle for all services was that it had to achieve the four A’s – Attractive, Accessible, Affordable and above all, Available. He said he would also drive hard for increased priority for bus services including community transport on Scotland’s very crowded central belt and key city road networks to improve journey times, reduce operating cost and boost modal shift. He said his department, in conjunction with other Ministries, like Health, were developing a refreshed National Transport Strategy which fully involves all sectors and achieves local delivery and local empowerment, or as he preferred to call it Community Empowerment, to deepen the role of Community Planning. He said that the Government would require all areas to work collaboratively, indeed it intended to make it a statutory requirement that they worked together and used available funding collaboratively to achieve best delivery. He stressed that the Government would not countenance a silo mentality by any stakeholder. By Silo Mentality he meant the attitude of not being willing to co-operate. He particularly focussed on Health where he said that there had to be better utilisation of the substantial vehicle pool held by this sector for the wider benefit of the community. He said that his Department was concerned about the recent changes to D1 licences and its detrimental effects on community and other socially important transport and his team were working closely with the DfT in Westminster to achieve a solution to the problem. He said that his Ministry was planning two key events in 2016; an Accessibility Summit and an Islands Conference. He believes that the Islands present golden opportunities for the testing of methods for integration of services and he also wants to see a growth in the use of vehicles powered by locally produced renewable energy sources and believes the Islands may hold the key to this. He further said that he wanted to see real progress on integrated Smart ticketing and threatened that if there wasn’t substantial progress on this, then regulation would be stiffened. He also said that his Department was looking at introducing a longer requirement for operators to give notice of changes to services to allow sufficient time for the impact of these to be fully assessed. I’ve listened to many Ministerial keynote speeches over the years but I have to say that Derek McKay’s ranks as one of the best I have ever heard. He was clearly totally up to speed with all the requirements of his Ministry. Unusually he also seemed very ready to take questions from the audience something usually sadly lacking from deliverers of keynote speeches. What is more, he was able to give full and concise answers to the majority of the questions thrown at him, When he didn’t know the answer he said so but said he would look into them, and you felt confident he would do. 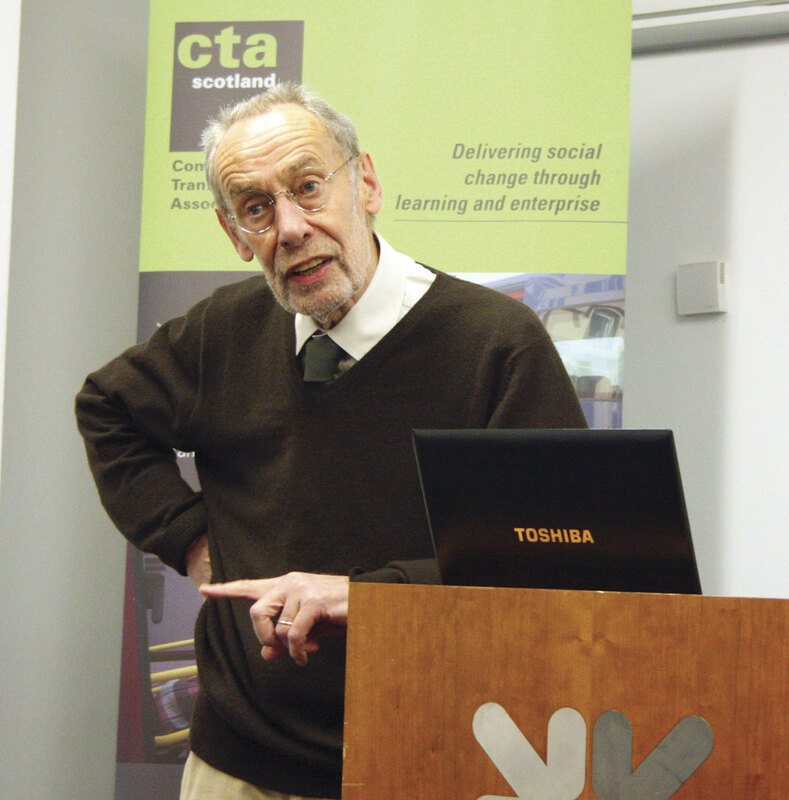 I have to congratulate CTA Scotland Director, John MacDonald, his Network Development Officer, Sheila Fletcher and the CTA Scotland Committee headed by Chair Rachel Milne who also controlled the conference, for the excellent planning of the event. Instead of, as many do, cramming the agenda full of items they restricted it to just five which gave the opportunity for meaningful presentations and plenty of opportunity for questions. They also chose good speakers who really knew their subjects. Following the Minister was Calum Irving, CEO of Voluntary Action Scotland picking up from a thread in the Minister’s speech and tackling the subject of Community Planning. He said there is now a recognition by the Scottish Parliament of the importance for all sectors involved to work together, for decision making to be opened up and particularly for the artificial fences erected by the Health and Social Services sector to be removed. He reminded everyone that that the Public Bodies (Joint Working) (Scotland) Act requires full engagement of the third sector in all aspects particularly planning, design and delivery of public services and failure to comply would not be tolerated. He also said that the upcoming Community Empowerment Act would demand that all community bodies be involved in Community Planning and the development of Community Plans and that the corner stone of the Plans would be ensuring that those with the least are fully involved in shaping decisions and the development of services. He said that in future services would be built around the needs of the people. There would be a stronger community voice, there would be genuine partnership working which would all go towards achieving better outcomes. Next up was Les Huckfield, from Glasgow Caledonia University talking about European Funding, a subject he clearly fully understood. I hope the representatives from the CTA Head Office took note because a similar presentation covering other areas of the country would be hugely beneficial. He outlined all the available EU funding schemes that could be accessed by community groups in Scotland including many schemes that people in the audience didn’t know about or did not appreciate could be accessed by them. Not only did Les explain the schemes in a simple, clear, concise manner, but also gave simple directions, mainly web based, on how to find out more about the schemes, who to contact and how to apply. Much of this information is in the form of documents that Les himself has produced from years of studying and dealing with European Legislation. All delegates at the Conference are to be supplied with a copy of the information contained in Les’s presentation. Les urged everyone ‘to get in there’, the ‘new buzzword in the EU is Community,’ said Les. 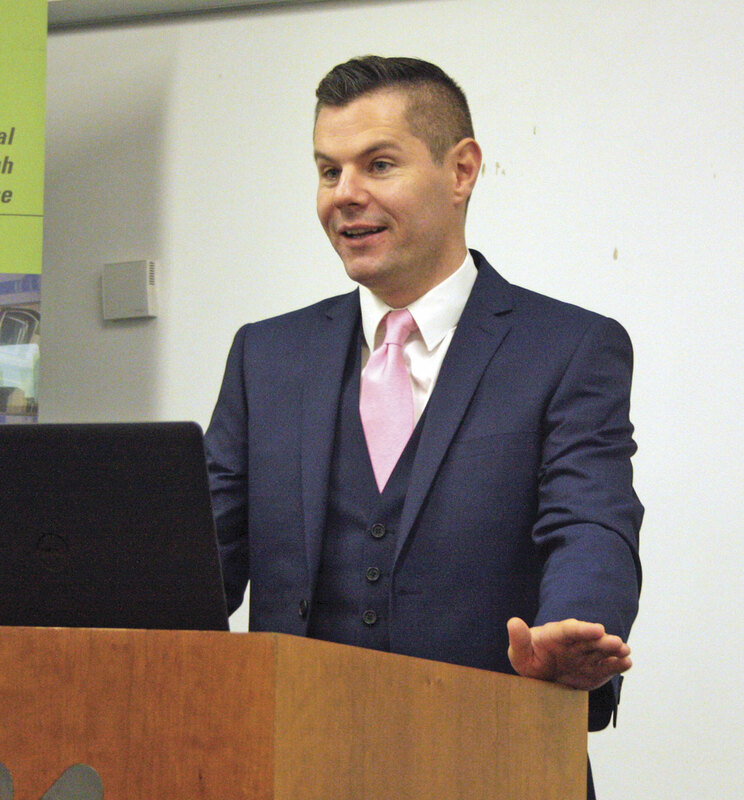 ‘If your scheme shows real benefit to the Community, particularly isolated and disadvantaged ones – your chance of achieving a grant is high,’ he said. The amount of European funding that is available is absolutely staggering – billions of Euros – and Les maintained that currently the industry is only scratching the surface of what it could get from Brussels. In the 20 minutes or so Les was on his feet I learned more about available European Funding than I’ve learned in 20 years. The final presentation was a double hander between Bill Freeman, Chief Executive of CTA-UK and its new Policy and Practice Director Gareth Blackett who joined CTA-UK in August from a solid background in running CT operations in the West Midlands. They centred on the recent controversy over the status of Community Transport vis-a-vie State Funding and Operating Regulation. I know from conversations I have had with Bill Freeman over the past months that this whole business has had a profound effect on CTA’s attitude and whilst it will always, and quite rightly, fight its corner it does recognise that there has to be change and above all there has to be clarity and transparency. It does not believe that the State Aid situation has been widely abused, but it does accept and indeed welcomes Government moves to clarify this area and to lay down clear, unambiguous rules of how and where it can be used. It is fully co-operating with the DfT over this area. It welcomes and is co-operating on the work being done by DfT to clarify the Regulation procedure for Community Transport operations. 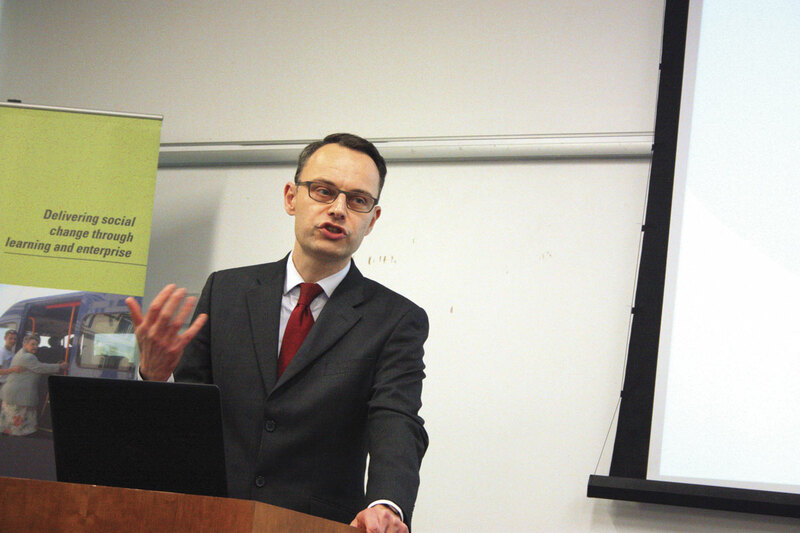 Gareth explained that one of the grey areas that is being looked at is Compliance under EU Regulation 1071/2009. He believes that under the Regulation there are three areas where certain CT operations should be exempted from Compliance. These are 1) Where an operation is out of scope because transport is only an ancilliary of its main purpose; 2) Where an operation is out of scope because it can be shown unequivocally to be non-commercial; and 3) Where the operation can be shown to have a very small impact on the market. The CTA is working closely with the DfT for the rules around these exemptions to be crystal clear and unambiguous. Another area they are working closely with the DfT on is redefining the use and granting of Section 22 and 19 permits and again they are looking for this to result in clear and concise rules on how these permits are to be used and absolute transparency of the rights of an operation to operate under those permits. The CTA has long campaigned for changes to be made to the issuing of Section 19 permits and it believes that it may be necessary for the number of organisations able to issue these permits to be substantially reduced. It would ultimately like it to be just one – the CTA. He also said that it was his belief that services judged to be non-exempt would require an enhanced standard of licensing and he believes this will be part of the recommendations that come out of the work they are doing with DfT. The CTA believes that the exercise is allowing an over-due opportunity to positively define the role of Community Transport and how it relates to the commercial sector. They believe it is absolutely vital that this is co-produced involving all affected areas and that the solution must meet all the requirements. The CTA welcomes the clarity the exercise will bring to the market and believes it will result in the raising of standards and a better experience for the passenger. Bill Freeman reminded the audience that the DfT and indeed the wider Westminster Government is fully supportive of Community Transport and like the Scottish Parliament believes that the sector does a highly valuable job and one that must be protected. He said the sector felt it had been unfairly pilloried over recent times and he was confident that the work being done by DfT involving all those involved would result in much more clarity, transparency and a removal of ambiguity. He said that he was impressed with the sessions he had attended at the DfT, many of them involving representatives of a range of organisations and the desire by all to achieve a solution that works for everyone. I must just mention the fifth element of the Conference. 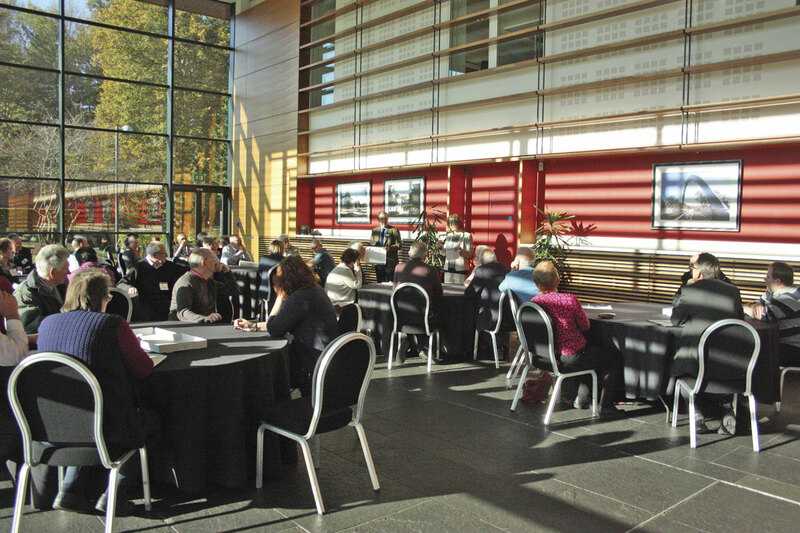 This was not strictly a community transport matter it was a request from the Scottish Parliament that the sector take an active part in its public consultation on making Scotland Fairer. To do this the audience was broken into small groups and each were given a pile of cards on which were statements of things thought to influence Scotland becoming a fairer Society. The groups had to discuss the statements and then vote on whether or not it would create a Fairer Scotland. Four voting options were offered from vital to not important. I took part in the discussions but, because I do not live in Scotland and because the results of the event would be fed into the consultation, did not vote. I found it quite amazing how much agreement there was over what would and would not result in a Fairer Scotland. Interestingly I think if the exercise had been done in England, Wales or Northern Ireland the results would have been very similar. The session was run by Amanda Cornish of the Scottish Community Alliance.